What a GREAT week! The Aspen are truly showing their colors this week and with a slight breeze - they were golden quaking Aspen - the west side of the lake is stunning with oranges, yellow and reds up the mountain side as it is across from the Café. Lots of fish stocked by Department of Fish and Wildlife from Filmore (too hot to stock over there) and SNOW - yup, Sunday morning, a bit of the white stuff dusted the Sabrina Basin mountains - sure was nice to see Mt Haeckel, Mt Wallace, Picture Peak and Clyde Spires once again with a bit of white - maybe more toward the end of the week. Yup, it's Fall! 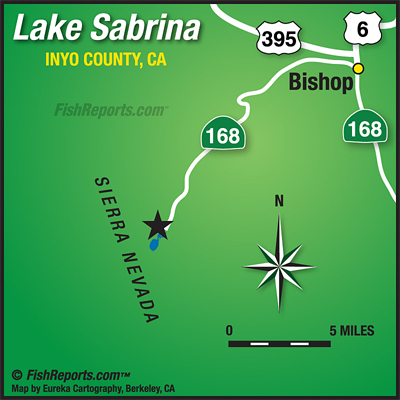 The catching continued at Lake Sabrina with the Inlets once again the best place to fish with Jigs (Sierra Slammers), Lures, NightCrawlers, Salmon Eggs and PowerBait - looks like just about everything was working back there. Dragging a Lure or NightCrawler along the shoreline or rock piles was doing the trick if you were trolling. PowerBait or Salmon Eggs brought in the fish if you were sitting on shore. Had a few big fish caught this week. Kelly Vogel of Ventura caught and released a nice Rainbow using a Sierra Slammer. Pete and Cindy Torgerson of West Hills pulled in a nice limit using Salmon Eggs and NightCrawlers. Ceasar Martinez of San Fernando caught his 3-pounder using a Red Worm. Dave Hernandez of Glendora landed a 2-1/4 pounder and a 2-3/4 pounder using jigs and friend John Tate of La Verne caught a 2-1/2 pounder also on a jig. Another friend, Nick Quinn caught a 2 pounder with a jig. Alex Solomko of Murrieta had bragging right this week using NightCrawlers to bring in a 2-3/4 pounder and 3-3/4 pounder. The monsoonal weather was back with a few thunderbooms during the week with a great lightening show down in the valley on Saturday and a bit of a light show at the Lake. On Sunday, a storm cell came thru early in the morning, dusting the Sabrina Basin mountains. A chance of snow coming in on Friday and thunderbooms over the weekend. Temps are expected to be in the mid 70s early in the week and then lower to the mid 50s by Saturday. Lows are to be in the high 30s early in the week and the high 20s toward the weekend (That 20s isn't a typo). DON'T FORGET YOUR JACKETS & YOUR WOOLIES! You can also check out www.weather.gov - enter Aspendell, CA (which is the little community right below Lake Sabrina) in the search field and you'll get the forecast for the higher elevation or take a look at Howard Sheckter, our local weather 'guesser' report at www.MammothWeather.com.